It goes my many names: Salsa, Picante Sauce, and Chile, to name but a few. It replaced ketchup as the most popular condiment in the United States back in the 1990’s. And in my house, it should come with a straw. 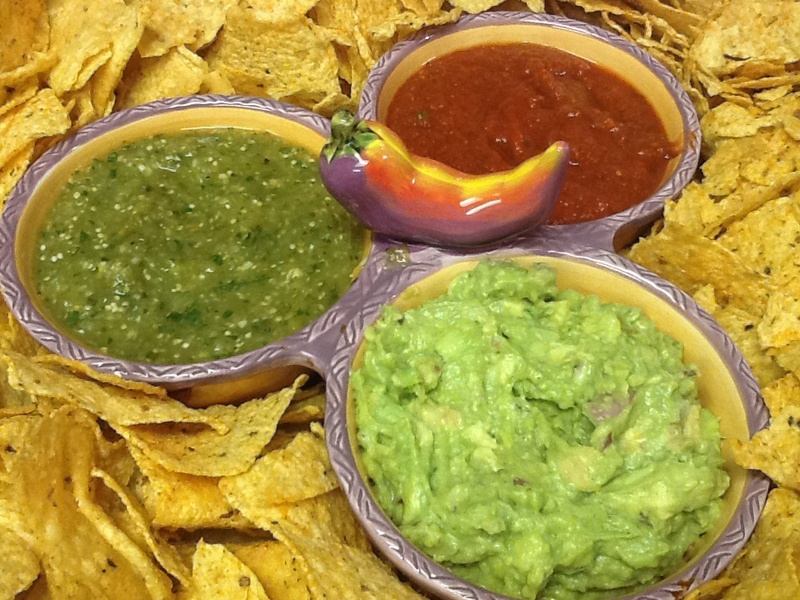 Because, as it is one of the main food groups, we go through Salsa faster than sweet tea and Co-cola. In fact, the only thing we use more of in my house, than salsa, is milk. And we go through about five gallons of milk a week. That’s no lie. I’m not sure how it works in the rest of the country, but in Texas, when you sit down at your table in a restaurant—doesn’t have to be a Mexican restaurant—the server will bring you a basket of chips and bowl of salsa. It’s really a very cute little bowl of salsa, and NEVER enough with my husband present. I always want to tell the server: “just bring a pitcher and save yourself the upcoming leg work”. He’ll eat it on anything and everything, or just with a spoon. 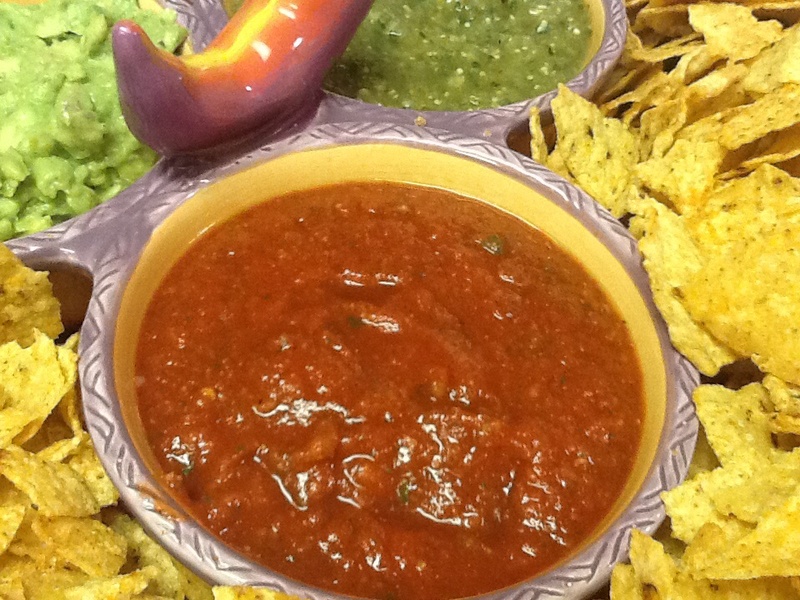 And since it is Fiesta time here in San Antonio, I figured it would be a good time to share some of my salsa recipes with you. The red one is a restaurant style salsa…Cooked briefly, a little sweet and not too hot, it’s the kind you would eat four baskets of chips with before your now pointless dinner arrives in front of you. The green one is a tomatillo salsa—bright and tart, and typically a bit hotter than red (although both are customizable to suit your heat tolerance). Which one is better? We like our food served Christmas style—a little of each—so we don’t have to make such silly decisions. Add all ingredients to a large saucepan or Dutch oven. Simmer over medium heat for 5 minutes. Using an immersion blender (or blend in batches in a blender), blend the mixture until smooth with only very small pieces remaining. Adjust seasoning and add more lime juice if needed. Pour into jars and store in fridge for up to a week. **one jalapeno for mild, 3 for medium, and 4 or more for HAWT. Place tomatillos and jalapenos in a baking pan (with sides), and place in a 425* oven for 15 minutes. Shake the pan occasionally so that all sides start to brown. Remove from oven and place all ingredients in a food processor or blender, and puree until all of the ingredients are chopped small. Place in jars and store for up to a week in the refrigerator. ← For Real, What Is Goofy, Anyway? OMG!! Texana that looks so good!!! great post! 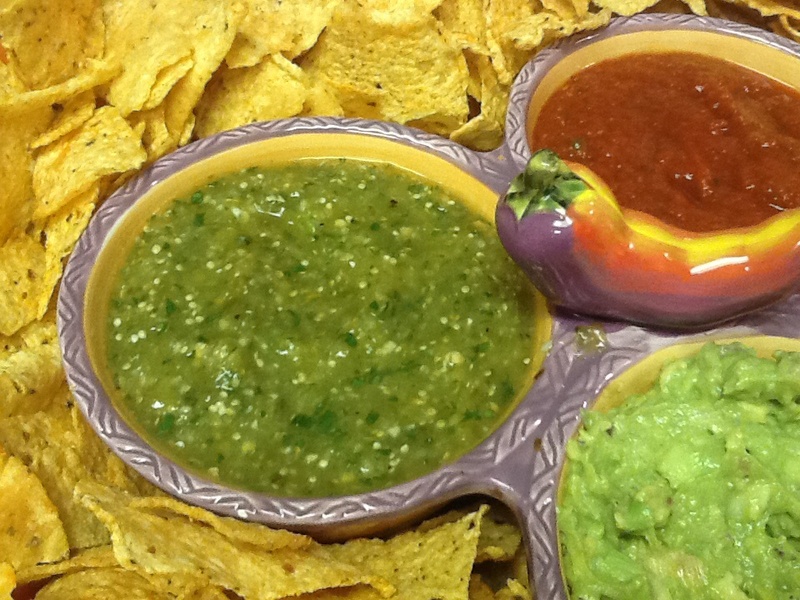 love the salsa recipes and you’re guac looks delish. i think i may have to make some tonight. yum. Hot sauce really is just soup! Healthy! If it were socially acceptable, I would probably bathe in guacamole. I’m probably not even kidding. We’re the same way with our salsas… My husband would put hot sauce on ice cream if I’d let him. I myself love the tomatillo sauce. I can’t wait to give your recipe a try! Avocado bath would be soooo good for your skin! I feel the same way about salsa at a restaurant. They bring the equivalent of a bag of chips and pair it was a 1/4 cup of salsa. Why! Why!!! Thanks for the great recipes!